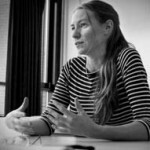 Toby Kiers received her Phd from University of California, Davis in 2005 with a focus on Ecology, Evolution and Agriculture. She became a University Research Chair and Professor at the VU in January 2014. Malin Klein is the Lab’s technician and curator of the fungal collection.Malin is in charge of propagating all biological material, and runs the molecular side of the lab. Bram Knegt is a Phd student co-supervised by Martijn Egas at UvAS. His research focuses on the plant-eating arthropod Tetranychus evansi – a spider mite. He is interested in the evolutionary forces driving aggressive behavior. Marie Duhamel was a Phd student (co-supervised with P. Vandenkoornhuyse) with a focus on microbial diversity in natural and agricultural ecosystems. She defended in November 2013 and continues to work on quantifying diversity. Erik Verbruggen is a former Phd student (co-supervised with M. van der Heijden) with a focus on mycorrhizae, agricultural and transgenic crops. He is now working in Belgium looking at mycorrhizal dynamics in long-term agricultural plots.